The minutes of the previous meeting of July 14th 2015 were approved. 1. Judi filled in the PC application form for funds for the Bugle. 2. The building on the Thistle Estates has been referred to the council. 3. Faith did talk to Meg to make sure Broadwells deliveries are no longer being dumped on her drive.All other matters arising had been covered or were to be agenda items.The minutes were approved. A report was circulated.Terry discussed the year end accounts. He explained the Nepal money had been paid to the DEC-Disasters Emergency Committee. Thanks were given to Terry. Hilary reported that the footpaths on Red Lane are difficult to negotiate because of overgrown weeds from the ditch and grass over the footpath. Rona told the committee that she had been in touch with Peter Hallam from the Highways Dept and that within a month they were scheduled to restructure the bank and bend in Red Lane, cut back the vegetation and build a retaining wall. Rona will ask him about the footpaths issues. Alice noted the lack of footpaths beyond the school and asked if this could be looked at . Rona will ask Peter Hallam. 1. AP2 petitioning- BGRA put in a petition and have had acknowledgement. Rona reported that there have been 187 petitions submitted. 2. Speedwatch. Terry reported at length how the speedwatch was going. There has been an incident with one resident that has been resolved by the police. The police are going to have a presence to show that it is a partnership between the police and the community. In the rush hour they are recording 1 person speeding every 2 minutes. Letters are going out but some people are not traceable. Fleet or trade car drivers are more difficult to trace. 3. Broadband update – The promised improvement in speed should be delivered within 2 months. 5. Youth forum and quiz.Oct 9th –Hoping for a good turnout. 6. Flower tubs- Hilary reported that the tubs are being emptied and refilled this week. Caryll Green asked if we could have a tub on Cromwell Lane under the Burton green sign, but we need a resident to be responsible for watering it. The committee agreed that a flower tub would be good and so Hilary and Mary will put that in place.Rona reported that she had had several volunteers to mow the Jubilee Verge. 7. Calendar- After a discussion it was decided that Alice will send details of howto upload and use the google calendar on iphones, tablets and computers, the committee members will trial it and report back. The committee have asked Janet to decide who stands down and needs re electing.All members present agreed to keep their allotted roles. As it’s the Associations 60th anniversary it was decided to have a cake and wine at the AGM. Decision to ask Vicki Aizlewood to make the cake taken. The fizzy wine has been donated by the Saxon family and thanks were given to them. Rona will contact the media to see if they would like to cover it as a story and to find the oldest resident to cut the cake.Rona suggested we have a banner made that was reuseable to publicize the event yearly. The village hall committee had a meeting with HS2 on Sept 11th to discuss moving forward. They should be in a position to report back on details at their AGM in November. Andy reported that the petition was in but we are not sure when it will be heard. Caryll reported that the clerk and councillors are settling in. The Notice Board will be ordered soon. There is an ongoing problem with the former chairman which is not resolved. They had had a meeting with the university so see how the university can engage with the community. The local plan is to be reported on at the next PC meeting. Caryll then outlined some planning applications including the Avon estates appeal. 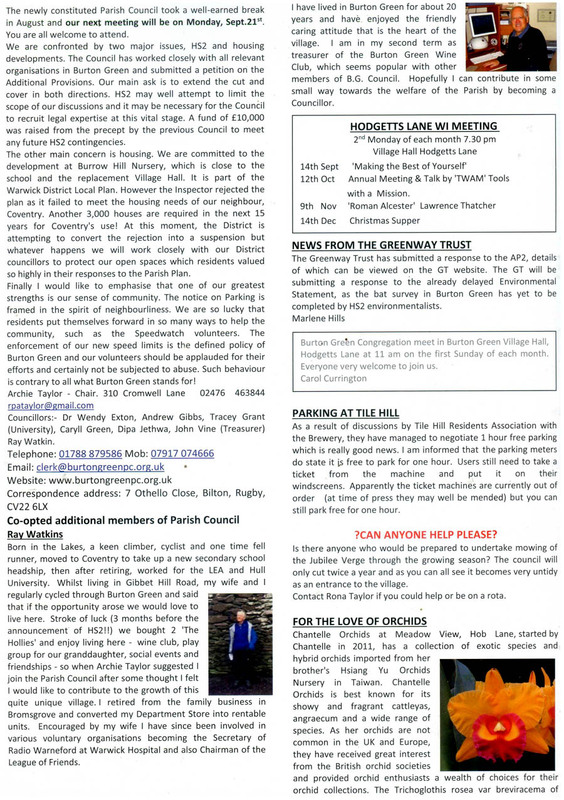 Caryll thanked the distributors of the Bugle who had delivered the parking notices. 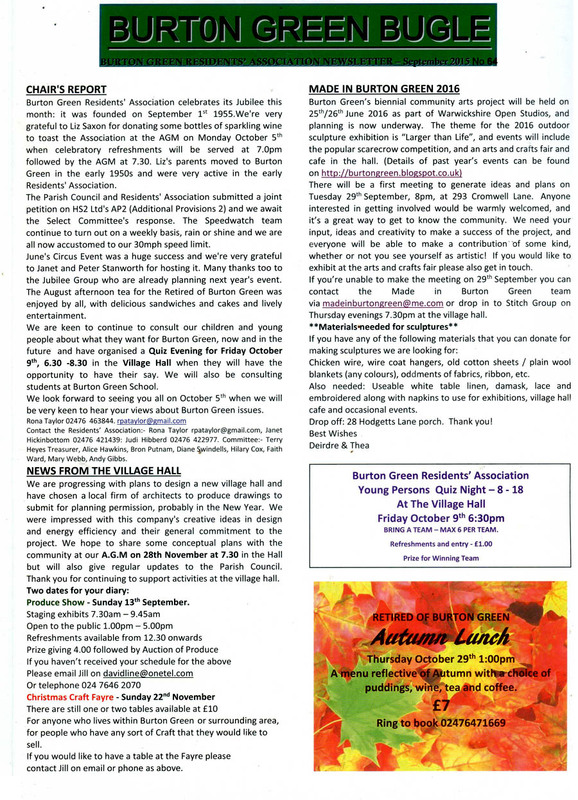 The next committee meeting would take place on Nov 3rd at 7.30p.m.at the Village Hall. The AGM is on Oct 5th 2015. Rona asked Judi to try and arrange provisional dates for 2016 to be discussed at the committee meeting in Nov.
as part of Warwickshire Open Studios, and planning is now underway. & cafe in the hall. Tuesday 29th September, 8pm, at 293 Cromwell Lane. contribution of some kind, whether or not you see yourself as artistic! If you would like to exhibit at the arts and crafts fair please also get in touch. Stitch Group on Thursday evenings 7.30pm at the village hall. colours), oddments of fabrics, ribbon, etc. 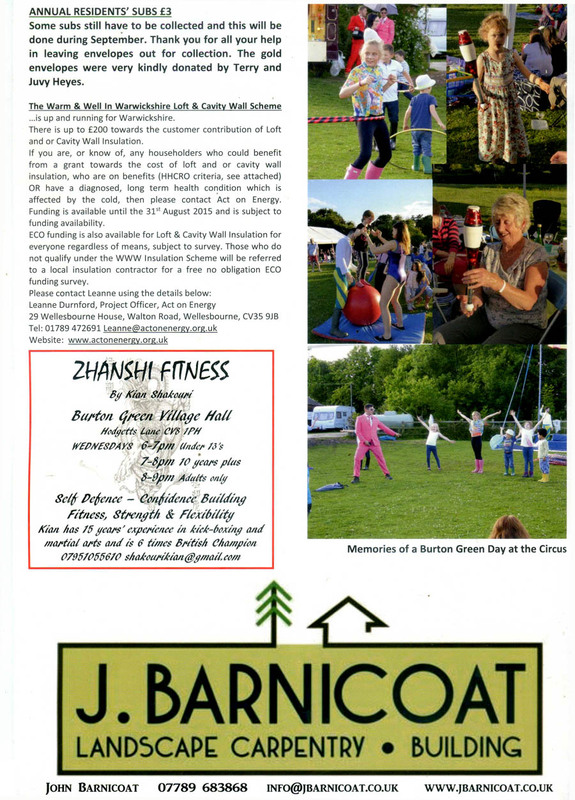 use for exhibitions, village hall cafe and occasional events. 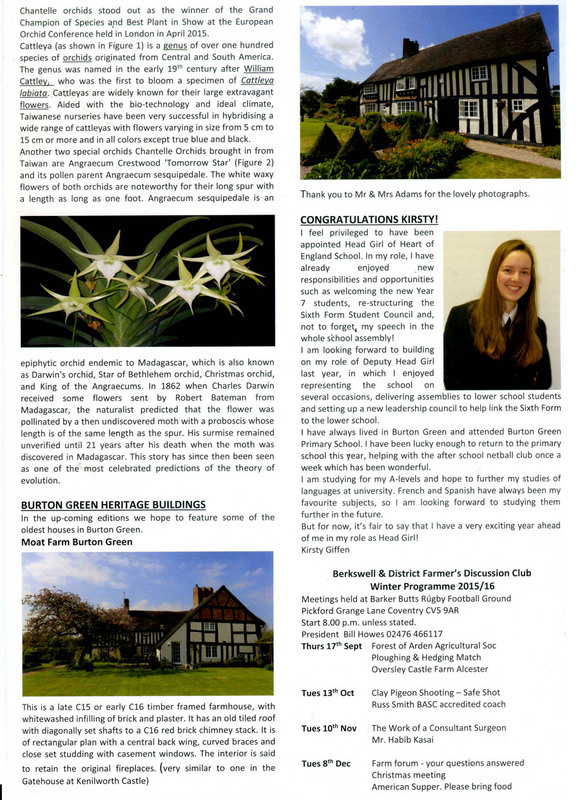 The September 2015 edition of the Bugle has been published.